JAMMU FEBRUARY 10- Justice Tashi Rabastan, Judge of the Jammu and Kashmir High Court today underscored the significance of mediation in judicial dispensation, saying this is a viable mode to resolve disputes without going into litigation for years. Tashi Rabstan laid emphasis on the need for establishing an environment conducive to constructive negotiations, describing this as the core mantra for successful outcome of Mediation process. He exhorted upon the participants to identify and take up all their issues regarding effective implementation of Mediation with their Presiding Officers and other concerned for redressal. He said efforts would be made to reach the district level courts with such programmes to ensure ground level implementation of Mediation. 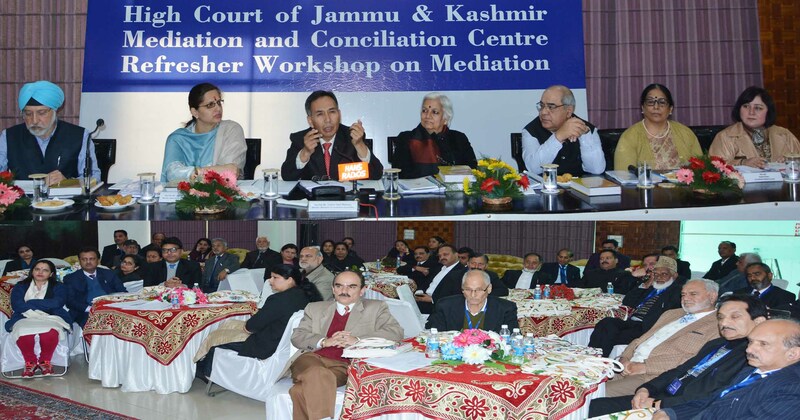 Justice Sindhu Sharma of Jammu and Kashmir High Court, while delivering valedictory address, traced the roots of mediation in the Indian ethos and culture and observed that this mode of justice dispensation could emerge as most effective tool to achieve dispute resolution. Justice Sharma described the Mediator Lawyers as the pioneers of the concept and hoped that by putting in their best for its success they will inspire the posterity as also leave an indelible mark in the judicial world. She emphasized the crucial need of generating awareness on mediation saying this is most important ingredient towards success of this ground-breaking initiative. “Contribution of lawyers towards societal welfare in terms of amicable solution of rising issues will go a long way in bringing about harmony and ending acrimony in the society”, she said and added that efforts should be made to make mediation a fully developed tool for resolution of disputes. Speakers and resource persons, while elaborating on their specified topics, emphasized the need for promoting Mediation as the way forward to dispute resolution in appropriate cases. They pointed towards cases which involve personal, commercial, human relationships and observed that only Mediation can sort out the issues to keep those relationships alive and healthy. Earlier, Justice Tashi Rabstan, chaired the VI session which covered the topics Impass and its types and stages besides techniques to break Impasse. Justice Sindhu Sharma chaired the VII and the last session which covered the topics Art of Settlement Writing including the uniqueness of a mediation settlement agreement, steps in writing a settlement and precautions for mediators while drafting settlements.